Saturday’s fifth round Investchem South African Formula 1600 championship delivered action aplenty, albeit somewhat of a stalemate in title terms as championship protagonists Nicholas van Weely and Stuart White took a race apiece at a sodden Aldo Scribante Racetrack in Port Elizabeth as they continued to fight it out for the championship cash prize and the Mazda Road to Indy shootout drive that comes with it. Sodden conditions in Friday practice cleared a little for qualifying to allow White to steal the bonus point as he topped the timesheets aboard his Fantastic Racing Mygale ahead of another young gun, Cameron O’ Connor’s similar Universal Health machine, Scott Temple (Mygale), local PE wildcard Chassen Bright (Fuchs Fantastic Racing Mygale), Tiago Rebelo (TRMS Mygale) and van Weely (Magnificent Paints van Diemen). Andrew Rackstraw (RDSA Investchem Mygale), Class B pole man Ian Schofield (Investchem) and Alex Gillespie (ERP Trucking Mygale) rounded off the top ten. were next up ahead of Class B runner Allen Meyer (van Diemen), Brendan Tracey (Investchem Mygale), local Class B driver Garth De Villers (Durrant Racing Mygale), Gerard Geldenhuys (Abacus Divisions Mygale) and a troubled Andrew Schofield (Investchem Mygale) at the back. 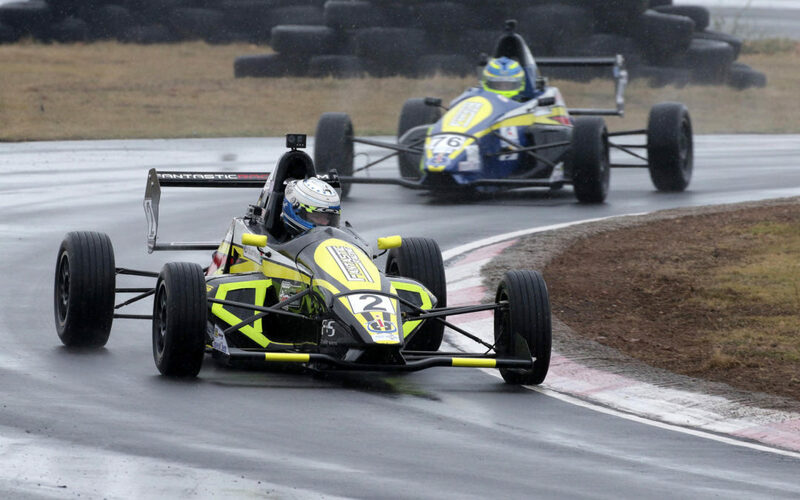 Treacherous wet conditions however returned for the first race that saw O’Connor into the lead from White and van Weely, but the red flags soon fluttered as Josh Dolinschek and Gerard Geldenhuys went off and their cars had to be retrieved. O’Connor and White were among the drivers who mistakenly made their way to the pit lane, while others stopped on the grid. This would turn the race on its head as those in the pit lane had to re-start from the pit lane behind the rest of the field, once the race restarted. That left van Weely to lead the way off the restart ahead of Gillespie, Ian Schofield, Temple and de Villers as O’Connor, White, Bright and Rackstraw staged a brilliant fightback through from their pit lane restarts, before the red flags flew yet again as Rackstraw and Rebelo’s machines became marooned and also required rescue. All of which saw to a single lap dash to the flag as van Weely led Ian Schofield home, but White and Bright almost miraculously emerged from the gloom in a Fantastic come from behind into third and fourth ahead of de Villers, Temple, O’ Connor and Gillespie. With three separate results in one race it was left to the timekeepers to merge the segments to see championship leader van Weely declared a comfortable winner over Gillespie, White, O’ Connor and Bright; Class B winner Ian Schofield, Temple, de Villers and Mankonkwana and Brendan Tracey closing off the top ten, while David Jermy, Allen Meyer and Andrew Schofield were also classified as finishers. Stuart White shot into the lead of the second race once it too was restarted still on a damp track following an early red flag; ahead of teammate Bright, with van Weely third. Bright and van Weely made light contact before Bright’s throttle stuck open and forced the local hero to retire and leave van Weely to chase White home while O’Connor and Rackstraw diced home to third and fourth. Temple was next up from Mankonkwana and a delighted maiden Class B winner, local man Garth De Villers; Andrew and Ian Schofield and Gillespie closing off the top ten. Tracey was next up from Rebelo, Geldenhuys, Meyer and Jermy. So Nicholas van Weely took the overall win to barely consolidate his slender title lead over Stuart White, while O’ Connor picked up the bronze medal for the day, with Temple fourth overall from Gillespie, Class B men Ian Schofield and home hero de Villers, as Mankonkwana, Andrew Schofield and Tracey rounded off the top ten for the day. The chase for the chance to join the Mazda Road to Indy continues at Zwartkops Raceway when the Investchem SA Formula 1600 championship visits Pretoria Saturday 18 August — diarise that now!